With Facebook Two-Factor Authentication (TFA), an additional code via the Facebook App is necessary to complete the sign-in process. However, iPhones will general disconnect from the AP if you attempt to navigate away from the Apple CNA. This prevents guest clients from accessing their Facebook App to obtain the TFA code. 1. 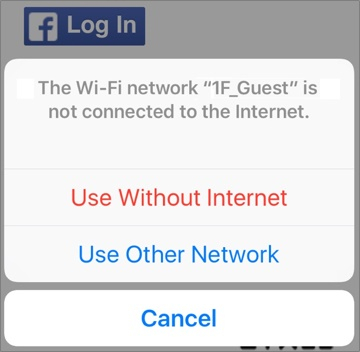 Connect the iPhone to the SSID with Facebook login enabled. 2. The iPhone's CNA should appear. 3. Wait 5 seconds and tap "Cancel"
4. Additional options will appear. 5. Select "Use Without Internet". 6. Access your Facebook App and obtain the code from the code generator. 7. Open Safari or any browser and navigate to a short URL (such as www.cnn.com). 8. The AP should redirect browser to the captive portal. 9. 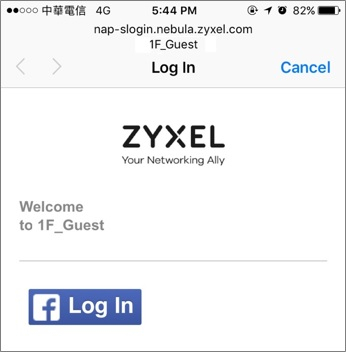 Tap the Facebook log in button and enter username and password. 10. Once Facebook prompts for your code, switch to your Facebook App and check your code generator. 11. Switch back to your Facebook in browser and input the code.